Motto: "What a Glorious Morning for America!" 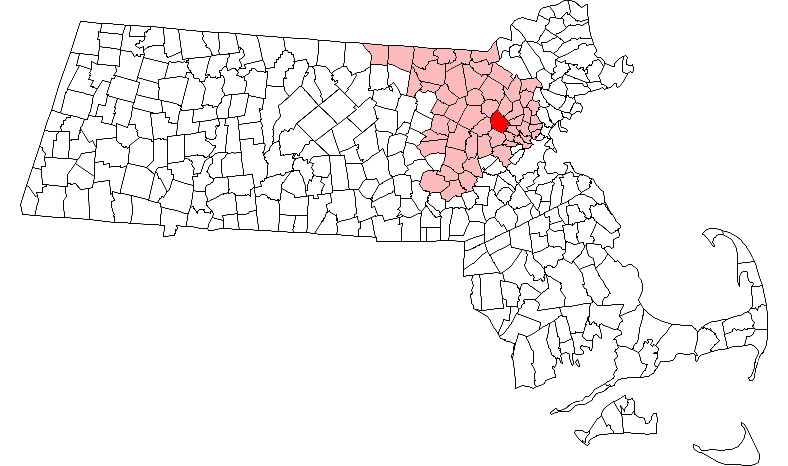 Lexington is a town in Middlesex County, Massachusetts, United States. The population was 31,394 at the 2010 census. This town is famous for being the site of the first shot of the American Revolutionary War, in the Battle of Lexington on April 19, 1775. Lexington was first settled circa 1642 as part of Cambridge, Massachusetts. What is now Lexington was then incorporated as a parish, called Cambridge Farms, in 1691. This allowed them to have a separate church and minister, but were still under jurisdiction of the Town of Cambridge. Lexington was incorporated as a separate town in 1713. It was then that it got the name Lexington. How it received its name is the subject of some controversy. Some people believe that it was named in honor of Lord Lexington, an English peer. Some, on the other hand, believe that it was named after Lexington (which was pronounced and today spelled Laxton) in Nottinghamshire, England. In the early colonial days, Vine Brook, which runs through Lexington, Burlington, and Bedford, and then empties into the Shawsheen River, was a focal point of the farming and industry of the town. It provided for many types of mills, and later, in the 20th Century for farm irrigation. For decades, Lexington showed modest growth while remaining largely a farming community, providing Boston with much of its produce. It always had a bustling downtown area, which remains so to this day. Lexington began to prosper, helped by its proximity to Boston, and having a rail line (originally the Lexington and West Cambridge Railroad, later the Boston and Maine Railroad) service its citizens and businesses, beginning in 1846. (Today, the Minuteman Bikeway occupies the site of the former rail line.) For many years, East Lexington was considered a separate village from the rest of the town, though it still had the same officers and Town Hall. Most of the farms of Lexington became housing developments by the end of the 1960s. On April 19, 1775, Lexington was the location of the first battle of the American Revolutionary War. A British military patrol made a forced march on Lexington and Concord on information from an informant that there was a large supply of weapons and gunpowder in the area. A force of Minutemen stood on Lexington Green to fight off the British. It is not clear where or who fired the first shot of the battle, but it is known as the "Shot heard 'round the world." Every year, on the third Monday of April, the town observes Patriots' Day. Events begin with Paul Revere's Ride, with a special re-enactment of the Battles of Lexington and Concord. At 6 a.m., there is a re-enactment of the skirmish on the Battle Green, with shots fired from the Battle Green and the nearby Buckman Tavern (to account for the fact that no one knows from where the first shot was fired, or by whom). After the rout, the British march on toward Concord. The battle in Lexington allowed the Concord militia time to organize at the Old North Bridge, where they were able to turn back the British and prevent them from capturing and destroying the militia's arms stores. Throughout the rest of the year many tourists enjoy tours of the town's historic landmarks such as Buckman Tavern, Munroe Tavern, and the Hancock-Clarke House, which are maintained by the town's historical society. Lexington is located at 42°26′39″N 71°13′36″W﻿ / ﻿42.44417, -71.22667 (42.444345, -71.226928). As of the census of 2000, there were 30,355 people, 11,110 households, and 8,432 families residing in the town. The population density was 1,851.0 people per square mile (714.6/km²). There were 11,333 housing units at an average density of 691.1 per square mile (266.8/km²). The racial makeup of the town was 86.13% White, 10.90% Asian, 3.13% Black or African American, 0.08% Native American, 0.01% Pacific Islander, 0.34% from other races, and 1.41% from two or more races. Hispanic or Latino of any race were 5.41% of the population. There were 11,110 households out of which 37.8% had children under the age of 18 living with them, 66.0% were married couples living together, 7.7% had a female householder with no husband present, and 24.1% were non-families. 20.8% of all households were made up of individuals and 12.3% had someone living alone who was 65 years of age or older. The average household size was 2.66 and the average family size was 3.10. In the town the population was spread out with 26.4% under the age of 18, 3.5% from 18 to 24, 22.7% from 25 to 44, 28.5% from 45 to 64, and 19.0% who were 65 years of age or older. The median age was 44 years. For every 100 females there were 88.7 males. For every 100 females age 18 and over, there were 83.5 males. According to a 2007 estimate, the median income for a household in the town was $122,656, and the median income for a family was $142,796. Males had a median income of $100,000+ versus $73,090 for females. The per capita income for the town was $61,119. About 1.8% of families and 3.4% of the population were below the poverty line, including 3.2% of those under age 18 and 3.4% of those age 65 or over. Lexington is also renowned for its public education system, which includes six elementary schools, two middle schools, and a high school. Lexington High School was recently ranked the 304th best high school in the nation by Newsweek. In addition to Lexington High School, students may also attend Minuteman Regional High School if so desiring. Lexington is probably most well known for its history and is home to many historical buildings, parks, and monuments, most dating from Colonial and Revolutionary times. One of the most prominent historical landmarks, located in Lexington Centre, is the Common, or as it later became known, the Battle Green, where the battle was fought, and the Minuteman Statue in front of it. Other landmarks of historical importance include the Old Burying Ground (with gravestones dating back to 1690), the Old Belfry, Buckman Tavern (circa 1704-1710), Munroe Tavern (circa 1695), the Hancock-Clarke House (1737), the U.S.S. Lexington Memorial, the Centre Depot (old Boston and Maine train station, today the headquarters of the town Historical Society), and Follen Church (the oldest standing church building in Lexington, built in 1839). Lexington is also home to the 900-acre (3.6 km2) Minute Man National Historical Park and the National Heritage Museum, which showcases exhibits on American history and popular culture. Central to the town is Lexington's town center, home to numerous dining opportunities, fine art galleries, retail shopping, a small cinema, the Cary Memorial Library, the Minuteman Bikeway, Depot Square, and many of the aforementioned historical landmarks. The Great Meadow a.k.a. Arlington's Great Meadows, is a sprawling meadow and marshland located in East Lexington, but owned by the town of Arlington, Lexington's neighbor to the east. The "Old Reservoir" used to provide drinking water to Lexington residents and surrounding areas. Now it offers a place to swim and picnic in the summer time. In the winter, when it freezes over, it is used as an ice skating area. Nicolaas Bloembergen, Nobel Prize in Physics. Noam Chomsky, professor of linguistics at MIT, creator of the theory of generative grammar and one of the most prominent linguists of the 20th century, as well as a noted political activist, commentator, and author. Mary Dailey (1928–1965), All-American Girls Professional Baseball League player. Peter A. Diamond, Nobel Prize in Economics, Professor of Economics at MIT, known for his analysis of U.S. Social Security policy and his work as an advisor to the Advisory Council on Social Security. Awarded the 2010 Nobel Prize in Economic Sciences, along with Dale T. Mortensen and Christopher A. Pissarides. Marian Morash, author of "The Victory Garden Cookbook." Married to Russell Morash. Marjorie Newell Robb, (1889-1992) One of the last Survivors of the sinking of RMS Titanic in 1912. ^ "Profile of General Population and Housing Characteristics: 2010 Demographic Profile Data (DP-1): Lexington town, Middlesex County, Massachusetts". U.S. Census Bureau, American Factfinder. http://factfinder2.census.gov. Retrieved April 6, 2012. ^ Tracing the Past in Lexington, Massachusetts. Edwin B. Worthen. ^ "METCO FAQ". Massachusetts Department of Education. http://www.doe.mass.edu/metco/faq.html?section=a. ^ Best high schools in America, May 23, 2005. ^ Fox, Margalit. "Gerald S. Lesser, Shaper of ‘Sesame Street,’ Dies at 84", The New York Times, October 4, 2010. Accessed October 4, 2010. ^ "Famous folks from Lexington". Boston.com. http://www.boston.com/yourtown/lexington/gallery/famous_celebrities_from_lexington?pg=14. Retrieved July 31, 2012. ^ "The Odd Saga of the American and a Curious Icelandic Flock". Google Books. http://books.google.com/books/about/The_Odd_Saga_of_the_American_and_a_Curio.html?id=ZxaStgAACAAJ. Retrieved May 5, 2012. ^ "Famous folks from Lexington". Boston.com. http://www.boston.com/yourtown/lexington/gallery/famous_celebrities_from_lexington?pg=13. Retrieved July 31, 2012. Wikivoyage has a travel guide for Lexington (Massachusetts). This page uses content from the English language Wikipedia. The original content was at Lexington, Massachusetts. The list of authors can be seen in the page history. As with this Familypedia wiki, the content of Wikipedia is available under the Creative Commons License.